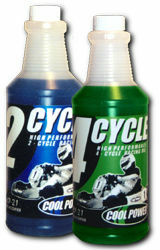 Cool Power Racing Oil is designed for the lubrication of High-performance Competition Kart Engines. It is fortified with a proprietary additive package to provide protection under the high loads, temperatures and high RPM's, experienced by the most radical motor. If you will be ordering a case or more at a time, please email me your zip code so proper shipping costs can be calculated. For orders of over 124 gallons, contact us for special pricing. HDM will be stocking Cool Power by the gallon only.